I think Rob paid more than that, started about $115k. Great to get a ride in it around Sandown ! Have these cars (ie. 968s generally) got more of a back seat than a 911? I think Rob was showing it with the Porsche owners club at the classic car show in Melbourne in 2012 got to say it looks a great car if only the minister for finance would sanction another purchase. 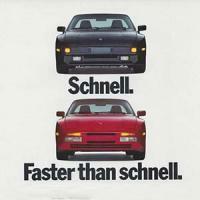 You could build a better 968 turbo starting with a good CS example for way less with more power and better suspension. Nice car but I don't understand the willingness of people to pay those prices for a replica built by someone else. Hmm...maybe...CS's seem to be at least $50k to start. Not really. This one's already black as well! That 968 CS is at a great price and shouldn't hang around long if all is in good order. My kids fitted in the 944 until they were 11 and 9. That was around town though (to school), you couldn't do a trip with them in there. The rear of the 944 is plenty wide enough and I can sit in there for head room, but as Cyber said the leg room is just too little for an adult. 60 x 968CS's were delivered in Aus, of these there were 14 x M030 cars and 13 cars with the 685 factory divided rear seat option. I believe of these there was just one M030/685 car, too. Yeah, that's waaay cheaper than I've seen any decent CS in the past. He's giving this away unless there is something seriously Cactus about it. Even if it needs a complete engine rebuild, it's still good value. ps...there's going to be a highly customised 968 turbo running around in Victoria with a trick engine (over 700bhp) sometime this year. Mostly on the track I suspect. Judging by all the posts on Rennlist lately, 968 Turbos are becoming as common as VW Beetles. I guess that won't help the prices of all these 'rare' replicas. Yea I have seen it, a lot of attention to detail and the engine dyno runs before delivery looked awsome. Do you have any more details on this beast Patrick? While we're on the topic of worked 968's - this supercharged black CS has been for sale for a good while too. Quite a few nice examples getting around at the moment. Starts post # 698 of this Rennlist thread. I've spoken to the builder Ivan a bit after this was posted and am confident Zoran's car will be very fast once the motor arrives down here and installed into his Unique 968. The car itself will have many modifications since it last was on the track! Well guys,i own the 968 CS MO30 with only 52,000 klms on it,I have bought and sold most of the Club Sport MO30 versions over the last 10 years.Yes you can build one of these to Fitzys specs $45,000 plus the car another $50 if you can find one with low klms and as good as my car.This car has orig Turbo suspension from the race division Germany.All the turbo hoses and fittings from the race division as well.Full bolt in cage,Peter Star exhaust system,traction control(Motec)360/380 HP.Extra boost switch.Turbo Big Red brakes 2 owner car,still has A/C.radio.It is in great condition and it owes me more than Im asking for it,but thats not unusual for us Porsche guys.I sold the race version to a mate of mine and had the pleasure of driving it at Rennsport.We drove my 968 up to Rennsport with the Original 18 inch Fuchs on it and had a lot of positive feedback on how good the car looks. This is my opinion only.The car owes me more than Im asking. Well guys i thank you for all your comments,some very good and some very NEGATIVE,you still have to pay $50,000 for a good 968 CS MO3O,and you could NOT build one the same as Fitzys for under $50,000 plus cage,plus suspension,plus,plus that will be as good as this 52000 klm car.and there is NOTHING wrong with this car or engine.If your in Melb come to RSR Garage and see for yourself.I have been buying and selling Porsches since the 90s.I have bought and sold most of the 14 968 CS MO30 in this country.If you are going to compare this car with other ones out there you cant,this is differentThis is a great topic,i always find in this business of selling special Porsches are that MOST of the negativecomments come from 2 things.being jealous of what someone has worked hard to get,or they cant afford it and want it.If i affend someone by saying this,well what can i say.RR. Interesting to see the differing opinions people have on these cars. The two 968RS cars on the market at the moment are chalk and cheese. The NSW car is ex WA. Multiple winner of the PCWA championships. Done Targa West in its early days. Been run hard, very very hard. Built at huge cost for a local PCWA stalwart, and then owned by another two members. It's had a big life. As good as it may now be it can never be the same as the RSR car which is straight, low kms, and a different proposition entirely. Both cars have Fitzgeralds expertise, and factory RS parts. I can understand why the NSW car hasn't sold yet, but the Victorian one is a mystery. Having seen just how hard it is to catch these things when they are well driven, I'm surprised no one has stepped up to run the Victorian car in Targas. It would clean up in its class. You can build a fast 968 with a turbo for sure, but you can't get those bits and that history anymore. You could drive the RSR car every day and still win most events you turned up at in air conditioned comfort. Sounds good to me, but I can't bring myself to buy it. Someone should though, it would be great fun to have and so advanced for its time.